Introducing the Olympus PEN E-P3, Olympus PEN E-PL3 (also known as the PEN Lite) and Olympus PEN E-PM1 (also known as the PEN Mini), the new range will see the discontinuation of other PEN models, with the exception of the E-PL1 which will continue to be available at a low price-point to appeal to newcomers to the PEN brand. The PEN E-P3 will be known simply as the PEN. All three cameras have 12 million effective pixels. While sharing the same basic specs, the 3 new models are designed to appeal to different areas of the market. At the top of the range, the PEN E-P3 caters to advanced users, the E-PL3 (Lite) in the middle for those perhaps looking to upgrade from a high-end compact, and finally the E-PM1 (Mini) for photographers who want DSLR quality images in a compact body. Also announced today, are 2 new M.ZUIKO prime lenses to slot into the existing PEN world lens line-up. First, a 12mm (effective 24mm) f/2.0 high-grade lens with an all-metal barrel and featuring a snap focus ring mechanism to switch between manual and auto focus. The lens is aimed primarily at E-P3 users and will have a street price of around £500. Secondly, a 45mm (effective) f/1.8 portrait lens is aimed at the more budget end of the market with a sub £300 street price upon release. New kit lenses introduced with the new cameras have had cosmetic tweaks, including snap-on silver bayonet rings to match silver lenses. New Olympus PEN models price and availability: The E-P3 will be available in August for an RRP of £799 including kit lens, but will also be available body-only. The E-PL3 (Lite) will be available in late summer, while the E-PM1 is expected in early autumn, prices for both cameras have yet to be announced. A new wireless compatible flashgun is also introduced. The FL-300R fits onto any PEN camera and has a tilt mechanism for bouncing flash and macro shooting. A built-in wide panel covers angles as wide as 9mm (18mm equivalent) while it covers a range of up to 8metres. 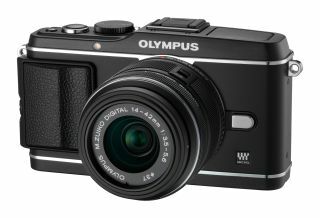 Read on to find more detailed information and specs for each new Olympus camera and lens.